Is a second automobile revolution underway? How can we improve our capacity to answer? Boyer R.,Freyssenet M., Is a second car revolution underway? How to improve our capacity to answer? , Slides presentation. 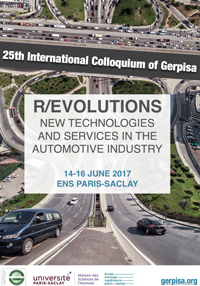 25th GERPISA colloquium, ENS Cachan, 14-16 june 2017, Numeric Publishings, gerpisa.org, 2017, 4,29 Mo ; freyssenet.com, 2017, 4,29 Mo, ISSN 7116-0941. Boyer R.,Freyssenet M., Comment, Is a second car revolution underway? How to improve our capacity to answer? , Transcription of oral comments of slides presentation. 25th GERPISA colloquium, ENS Cachan, 14-16 june 2017, Numeric Publishings, gerpisa.org, 2018, 560 Ko ; freyssenet.com, 2018, 560 Ko, ISSN 7116-0941. The slides presentation and the comments are downloadable. Please, go to the bottom of this page. 2. 2. Were the conditions of possibility of a second automobile revolution reinforcing or not, since 2012 and how could they change? 2.1. 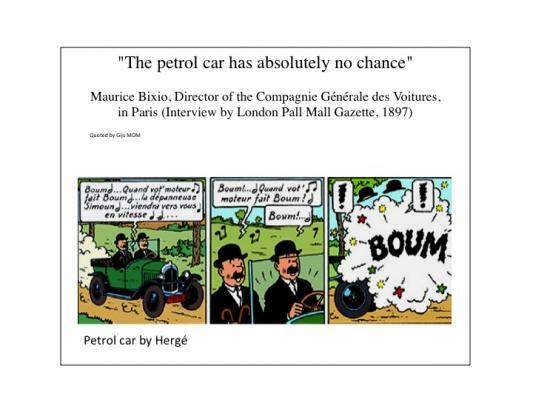 First condition: The crisis of petrol car was deepening, but with variable intensity by region. What can change the intensity of the crisis on regions? Why the current degree of maturity of each solution is important ? Freyssenet M., The Second Automobile Revolution is Underway. Scenarios in confrontation, in G. Calabrese (ed. ), The Greening of the Automobile Industry, Palgrave, 2012, 304-322 pL Digital publication, freyssenet.com, 2017, 200 Ko, ISSN 7116-0941. Freyssenet M., La industria automotriz en la crisis económica y ambiental mundial : lo que esta en juego, Ponencia para la conferencia «Pasado, Presente y Futuro del Automóvil en Castilla y León », Universidad de Valladolid, Valladolid, 19-22 septiembre 2011. Edición numérica : freyssenet.com, 2011, 2,6 Mo, ISSN 7116-0941. Freyssenet M., Three possible scenarios for cleaner automobiles, International Journal of Automotive Technology and Management, issue n°4, 2011. Digital publication, freyssenet.com, 2013, 217 Ko, ISSN 7116-0941. Freyssenet M., La seconde révolution automobile : ses promesses et ses incertitudes, original en français de «The second automobile revolution : promises and uncertainties», in Freyssenet M. (ed. ), The Second Automobile Revolution. Trajectories of the World Carmakers in the 21st century, Basingstoke and New York: Palgrave Macmillan, 2009, pp 443-454. Édition numérique : freyssenet.com, 2009, 196 Ko, ISSN 7116-0941. Freyssenet M., Are we at the outset of a Second Automobile Revolution? Inquiries proposal. Slides presentation, in Jullien B. (dir. ), Proceedings of the 17 th international colloquium of GERPISA « Sustainable Development in the Automobile Industry: Changing Landscapes and Actors », 17-19 june 2009, Paris. Digital publication, gerpisa.univ-evry.fr, 2009, 1,5 Mo; freyssenet.com, 2009, 1,5 Mo, ISSN 7116-0941.